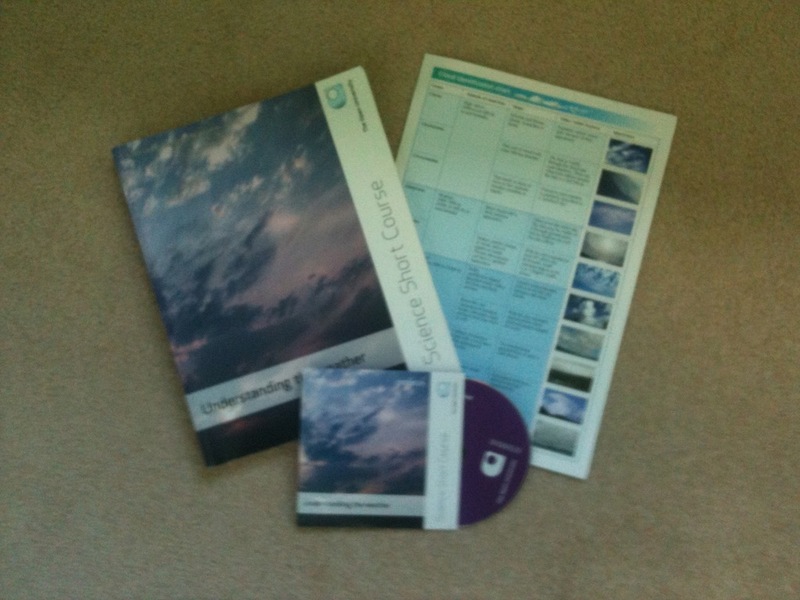 At the end of last year I successfully completed an OU Science Short Course entitled “S189 Understanding the Weather“. This post is a mini review of the course which I hope will be useful to those considering studying it themselves. According to the OU their Science Short courses are intended to be short (obviously), flexible and interesting study topics. From my experience on S189 these objectives have been met. On the short and flexible fronts there is the option to complete the course over six weeks or five months and there are currently four start times for the course each year. I took the five month option and completed the course in four months. However, if you have plenty of time to study, then a six week completion time is certainly achievable as the course is not overly taxing. Whether or not a given topic is interesting or not depends very much on the student. I personally find the field of meteorology to be a fascinating one and the course material did not dampen my enthusiasm for the subject matter. Signing up for the course was simple enough. I simply created an account on the OU web site, selected the course and, of course, paid for it. At £170 S189 is cheaper than most OU courses. However, you’ll also receive significantly less course credit for it than its more expensive counterparts where, I would imagine, far more effort would be required to gain a pass. Of main interest is the text book around which most of the study revolves. This is of a high quality with well-written text accompanied by plenty of informative diagrams, charts and maps. The book is split into nine chapters which cover various weather topics. The initial chapters cover the basics such as temperature, humidity, air pressure, precipitation, wind, etc. Subsequent chapters build on this knowledge to cover weather systems, weather measurements and forecasting. The closing chapters cover extreme weather such as storms, hurricanes and tornadoes before the book ends on the topic of (sometimes extreme) weather impacts. The main text is punctuated by questions that test the reader’s knowledge as they absorb the material. The answers can be found at the back of the text book. I found answering these to be a useful exercise as this reinforced my understanding of the concepts I had just read about. At intervals the reader is also directed to carry out activities. These are usually directly related to the current topic and cover a diverse range of tasks. The supporting materials for these tasks are sometimes available on the accompanying DVD (e.g. video clips to be watched or photographs to be studied) and sometimes sourced from the couse website (e.g. detailed activity instructions concerning access to third party meteorological websites). The activities are diverse in nature and, again, are good reinforcement for the written materials. The most enjoyable activities for me were the practical ones. I especially enjoyed the ‘Observing the Weather’ activity which involved taking a day to make my own weather observations at hourly intervals. I was happy to spend a lot of time and care on this activity as it is one of two that, with the addition of analysis of my observations, are counted towards the final assessment. On the subject of the assessment it is important to note that S189 does not require a formal exam. Instead students are required to complete an electronic assessment. The assessment takes the form of a series of questions that are made available on the course website. The assessment I undertook was certainly challenging and I had to draw from knowledge I had picked up throughout the course materials. I was pleased to note that some of the questions were topical in nature drawing from recent events such as the volcanic eruptions in Iceland earlier in the year. This made answering them a more interesting experience. After nearly four months of study I really appreciated the electronic assessment format as it allowed me to take a lot of time to prepare my answers and polish off the activity work I had carried out over the previous months. I took around a week to complete the assessment but it could certainly have been finished much more quickly if time had been short. With the assessment complete and submitted I waited patiently for the results. This was a long wait partly because I completed the course a month before the five month deadline. However, my results still took over six weeks to arrive beyond the course deadline. This was a little too long to wait for my liking. In addition, the feedback was a little underwhelming going into very little detail as to where I had done well or badly. The markers instead preferred to produce a summary describing how most people had performed on particular questions and assessed activities. This struck me as being a little bit cheap but, then again, it is a relatively inexpensive course. Regardless, I was happy enough to have passed the course and did not feel that I had done badly in any particular area after the effort I had put in. I would certainly recommend the course to those with an interest in meteorology although it is probably of most utility to the beginner, such as myself, who starts from a position of knowing very little about the subject.